It all started back in 1993 when scientists first began revolutionary research on genetic editing. Now, decades later, scientists at Energyne have built on that foundation, making remarkable breakthroughs in DNA manipulation. But they've come with a nasty side effect: lab animals mutating to become much larger and more aggressive than they naturally are. Researchers on a space station are unable to cage the genetically modified beasties they've begotten. And one day, an experiment in orbit goes disastrously awry, sending genetically modified particles raining down on the San Diego Zoo and into the bloodstream of a gentle giant of an albino gorilla named George. The same particles find new hosts in an alligator and a wolf elsewhere. The result? Each animal grows in size and aggression, thanks to their newly altered genetic codes. George is more giant than ever, but he's anything but gentle now. Who can stop these creatures' Godzilla-like rampage? Perhaps only George's longtime trainer, primatologist and all-round animal whisperer Davis Okoye. He bands together with Dr. Kate Caldwell to save the planet from being ravaged by the monsters that mankind has unwittingly unleashed. 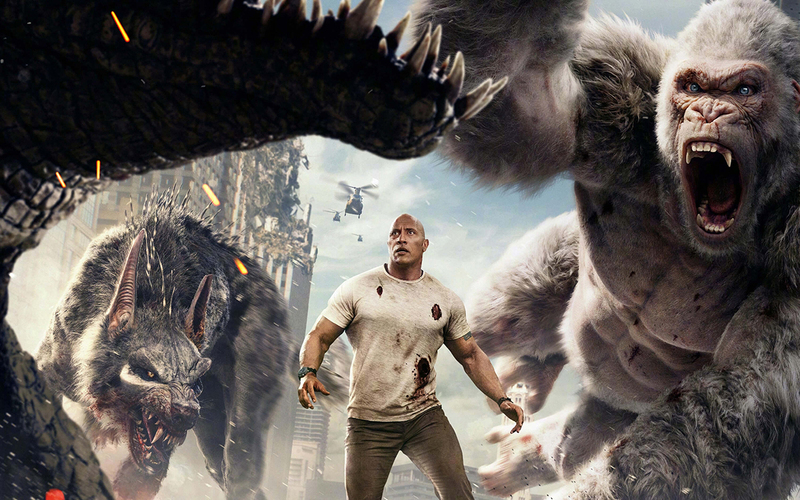 Rampage delivers a message about the importance of preserving life on Earth even as the story warns against the unknown risks of monkeying around with animals' genetic codes. Davis has the ability to connect deeply with animals and relate to them in intuitive ways. And Davis and Kate courageously put their lives on the line (along with other minor characters) to stop the mutated monsters from tearing down skyscrapers. Humanity's goodness gets questioned at certain points, but it's obvious that heroes can still stand up against those who commit evil. The film also suggests that those who are cruel, harsh and vindictive will eventually face justice. The value of friendship is another redemptive theme here. Female characters wear revealing outfits, and Davis has some flirtatious encounters with women, causing others to want to imitate his physical appearance. Humans get crushed in the movie, and buildings, vehicles and airplanes explode as the monsters destroy them. Someone gets eaten by one of the mutated animals. We see bloody attacks, animal carcasses and dismembered human body parts. Human weapons—guns, tranquilisers and bombs—wreak more havoc but often fail to yield the desired result: dead monsters. That's due in part to the genetically modified DNA within them that enables them to regenerate quickly and causes them to just keep growing, and growing. Not only do animals attack humans, but humans attack one another too. Several scenes include soldiers and civilians carrying guns and weapons of various kinds, and using them against one another. A man gets shot, and a woman is blown to pieces. There are also multiple scuffles involve punching and fighting. Swear words are peppered throughout the movie. George, the gorilla, performs crude hand gestures twice. This is a typical Dwayne Johnson movie: Buildings explode, the end of the world is near, and only one man can save the day…I’m sure you can guess who that is. Though the film does convey some socially conscious messages that will likely resonate with certain viewers, it also includes loads of violent imagery and profanity that might make family audiences re-consider making this film part of their movie plans.